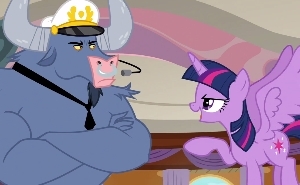 Episode 165: "Once Upon a Zeppelin"
Intro: Twilight Sparkle receives an invitation from her parents to join the family on a vacation they won. Act 1: Twilight, her parents, Shining Armor, Cadance, and Flurry Heart board an airship for a cruise. Twilight sets up activities for them all, with her highest hopes set on seeing the Northern Stars at sunset. They soon discover that Iron Will is running the cruise for tourists who want to meet her royal family. Act 2: Bound by contract, Twilight offers to spend the day doing Princess activities for Iron Will on the condition that the rest of her family be able to manage their own time. One tourst, Star Tracker, wins the prize of spending the day with her, and the schedule prevents Twilight from doing anything with her family. Finally, her autograph session runs late enough that she misses the Northern Stars. Act 3: Twilight is heartbroken and blows up at her family and Star Tracker. After Cadance offers some perspective, Twilight apologizes. Iron Will then tries to press them into more activities, but Star Tracker stands up to him, leading to a tourist revolt. Iron Will abandons ship, leaving Twilight's family a quiet evening to bond. Character: It's been a few seasons since I talked about core desires. When I first began evaluating MLP, I noticed that each of the Mane Six has a core desire that motivates a lot of their actions and helps explain their strengths and weaknesses. In Twilight Sparkle's case, what she wants most is to achieve a high standard of personal excellence, both knowing for herself that she's doing well and avoiding falling short of others' expectations of her, in about equal measure. It's a very anxious desire for her, despite all the encouragement she receives from those closest to her, since she sets such a high standard for herself. At different stages of her life, she's been obsessed with being a good student, being a good friend, and now, being a good princess. That desire, or put less positively, her fear of falling short of being a good princess, is part of what drives Twilight's actions in Once Upon a Zeppelin. But just as important is her care for her family. She sincerely wants to be considerate of them, and so she sacrificially subjects herself to Iron Will's con for their sake. But once she's thrown her chips in, folding or even expressing her discomfort would be un-princess-like, as she sees it. Yet she's only a pony, and she has a breaking point. She's lucky she didn't break in a more public setting, but she knows both before and after her outburst that her ordeal is self-imposed. More on that in a minute. Cadance is the positive example here. She's been a princess since adolescence, and she's worked out how to balance her needs with those of her subjects and set boundaries accordingly. She also points out that the birth of Flurry Heart helped clarify some of those boundaries. She's quick to rescue her foal from the enthusiasm of the crowd, and also shield Shining Armor from embarrassment, and she manages to do both graciously and without harming anypony's pride. A little sidebar on Cadance: If anyone questions Twilight's assumption that Cadance should spend the trip with Flurry Heart rather than getting a break from parenting, I noted once before the likelihood that Shining Armor was the primary caretaker, in view of Cadance's princess duties. It's very possible that getting to spend as much time with Flurry Heart as she can IS a nice break from the norm for Cadance. Star Tracker is one of those tricky guest characters who needs to be annoying to our protagonist while not being annoying to the audience. I credit the writers and the vocalist for pulling it off here. He's nervous, he's excited; this is his dream come true. He's good-natured but overcome by all this, and I can accept that he's young and overeager enough not to realize he violates her personal space about a dozen times. Yeah, she really should have said something. But I suspect all of us have an embarrassing story about being starstruck. I adore the characterization of Twilight's parents, who display near-opposite facets of Twilight's personality. Twilight Velvet especially is a joy to watch, and both parents are attentive to their children's needs. I like that they're not at all oblivious to Twilight's situation, and appeal as much as they reasonably can for her to dial down her self-flagellation. Sharp-minded viewers will remember that, like Chekov with Khan, Twilight Sparkle did not appear in Iron Will's previous featured episode. I would have liked a line indicating she'd heard about him second-hoof, but even so, she's not happy to see him. He's not a villain per se, but what we see here matches his tendencies in Putting Your Hoof Down: The minotaur markets himself and manipulates other ponies to promote his projects, all to turn a profit. Yet he takes agreements seriously and holds both himself and others square to commitments. Just don't forget to read the fine print. Lesson: We already had the moral about self-care in two Fluttershy episodes this season, so what's the twist this week? When Fluttershy "leaned in," it was in pursuit of a dream she undertook for herself. Yes, she was helping Dr. Fauna relocate her critter surplus, but her sanctuary went far beyond that. Standing up for herself was part of what it took to make her dream happen. Flutter's adventure for Zecora was at the opposite extreme: This time, she forgoes self-care in a literal life-and-death task to save a friend. This week, Twilight puts herself in an undesirable situation to save her family some inconvenience, but she does it both unnecesssarily and in a way that is needlessly short-sighted. 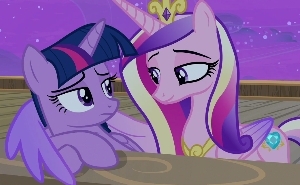 The primary moral is delivered in the evening discussion between Cadance and Twilight, and given specifics in the apology scene; it's about setting boundaries and being honest both with yourself and others about how you're faring. Cadance knows how to hand off responsibilities or excuse herself as needed, and the family gives Twilight numerous opportunities to do just that. In fact, if the five adults had just rotated their duties, they would have had only one or two commitments apiece. A secondary lesson is implicit in Cadance's assurance that Twilight is "already a good princess." This is Twilight's recurring issue. She needs to acknowledge her own adequacy. Those who know her best think the world of her, and this cruise is totally extraneous to her princess duties. We even see at the end that the tourists hold no hard feelings toward her when the cruise falls apart; they rightly blame Iron Will. But if not, their opinion matters no more than the crowds in Fame and Misfortune. Those lessons address Twilight's two noble-minded reasons for putting herself through all this. But what if you still want to go the extra mile for your friends, or make an exorbitant sacrifice just to show you care? Then you've got to pony up and take responsibility. Know what you're getting into and own the consequences of your self-imposed burden. If, for example, you pick up an extra shift at work for a friend, make sure you know the job and that your schedule is clear, then do the job without grumbling. If you give your waiter a hundred-dollar tip, you don't complain to the restaurant about how much it blew your budget, but also make sure beforehand that you have enough money left to get home. But by all means, if you get yourself in over your head, confide in friends and family and find ways together to make it not so bad. In Twilight Sparkle's case, once the deal is set, she really is stuck doing whatever princess activities Iron Will demands, but she could still ask for some personal space and autonomy within that. In particular, as a stipulation to her deal, she could have insisted on having time out to see the Northern Stars. Then it would be a matter of holding Iron Will to his side of the agreement, much as Fluttershy once did. Resonance: Somehow, Twilight missing the Northern Stars breaks me up even more than the loss of the Golden Oaks library. I think it's because the show builds her desire so much and gives Twilight plenty of time to emote, and also because Twilight's mistake was so noble-minded. But her apology and her handling of the tourists at the end shows admirable maturity. 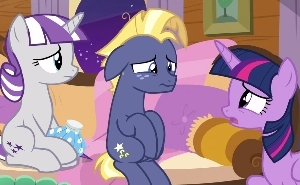 The concern Twilight's family shows for her, in fact the family's interaction in toto, warms my heart and is a fitting conclusion to this season's run of family-themed episodes. Star Tracker evokes a decent range of feelings in his innocently creepy role that's so awkwardly easy to identify with, and his standing up for Twilight in the penultimate scene puts the perfect cap on his character. Twilight Velvet has the funniest wet mane we've seen thus far. The show manages to get good laughs out of Shining Armor's air sickness without playing up the gross-out factor. I find Flurry Heart's baby-stacking hilarious, as well as Cadance's continued efforts to keep the tot's magic from getting out of hoof. And Iron Will provides much of the humor throughout, from his preposterous story about Cadance's baby Spike versus the fire monster, to his literal golden parachute. Other Impressions and Final Assessment: The motion of the plot is determined by Twilight's established personality traits (as well as Iron Will's, of course). 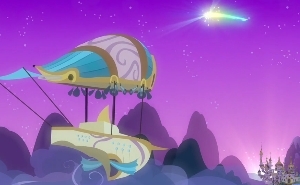 And there are so many other things make this episode wonderful: the setting of the zeppelin, the aforementioned family dynamic, doing something special with a lot of characters, the mostly new background ponies, the quick pace of the activities (all of them in act two), the screaming fans, and some truly poignant personal moments. The realistic portrayal of Twilight's anxiety sets this above the equally entertaining but exaggerated Lesson Zero, and it nearly surpasses this season's opener. Truly a superb episode.